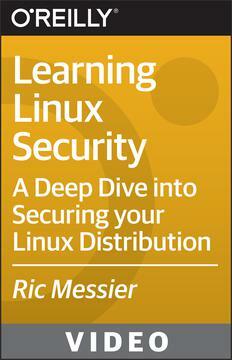 O'Reilly - Learning Linux Security | Free eBooks Download - EBOOKEE! Posted on 2019-02-19, by everest555. In this Learning Linux Security training course, expert author Ric Messier will teach you how to secure a Linux system. This course is designed for the absolute beginner, meaning no Linux Security experience is required. You will start by learning about booting, then jump into covering service management. From there, Ric will teach you about logging and log management, intrusion detection and preventions, and users and permissions. This video tutorial also covers utilities and the Linux Kernel, including Kernel modules, builds, and managing Kernel parameters. Finally, you will learn about firewalls, such as iptables, targets, rate limiting, and zones and services. Completing this computer based training course will kickstart your understanding of Linux security. No comments for "O'Reilly - Learning Linux Security".